Although our weather’s sunny and bright with the birds singing, it’s a bit cool this morning — down to the mid-forties. But we’re sure okay with that. 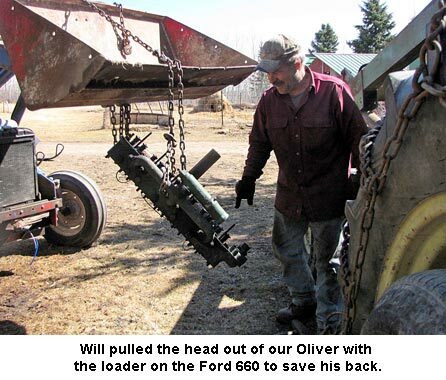 Will decided it was time he started repairing equipment, beginning with our Oliver tractor, “The Hulk.” It has a bent rod and needs the valves ground, among other things. This morning, Will pulled the head and started taking things apart. He was happy to discover the cylinder walls are pristine. So at least that much is good. A friend with equipment and experience volunteered to grind the valves. I’ve been busy transplanting tomatoes. Whew! There are a lot of tomatoes. But while I was working, I spotted the pair of geese who nest on our little beaver pond, below the house. 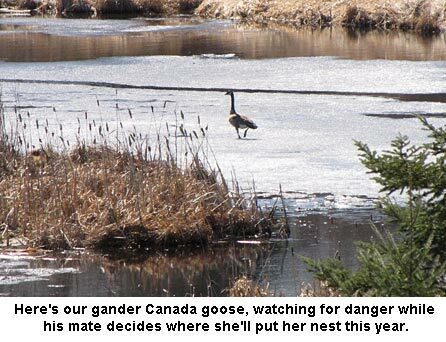 While the female goose was busy exploring the shore for a nesting site, the gander was walking on the ice, watching out for trespassers, honking loudly all the time. We love to watch them hatch a brood and swim about with little, fluffy, yellow babies. While I was feeding the goats this morning, I spotted a male robin hopping about on our front yard. 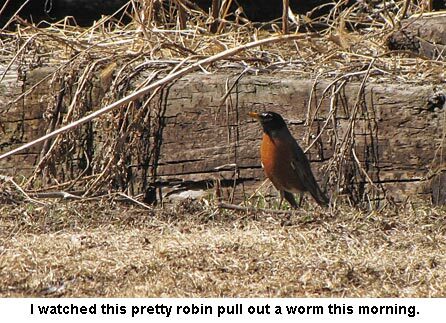 He even pulled up a worm — I didn’t think they were thawed out yet! Please don’t ever stop the”Ask Jackie”. This is always fun to read and an easy way for us to keep track of what is going on up there. I hope the tractor repair goes well. Even week old chicks can go outside on warm, sunny days. But they shouldn’t be permanently outside, even with shelter, until they have feathered completely out. 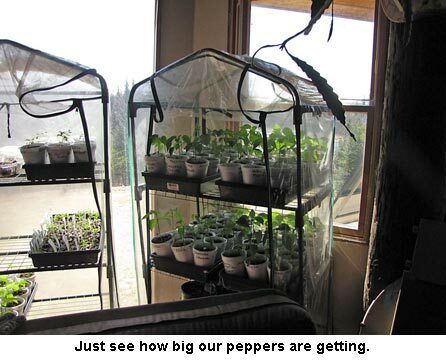 By then they have protection against the cool wind and are smarter about seeking shelter if bad weather threatens. How big do my new chicks need to be before being put outside? About 3 weeks ago I bought 5 “big” chicks who were getting their pin feathers. The same day, I also bought 7 little ones with 2-3 feathers on their wingtips. Assorted breeds-White Rock, Barred Rock, Plymouth & 3 Rhode Island Reds. Compared to the others, the Rhodies are very petite & delicate. The White Rock, aka Chubby, is getting pin feathers now. My bigger chicks have taken care of the younger ones & they sleep in a huddle. They are presently living in a large rabbit hutch in the garage until they go outside.